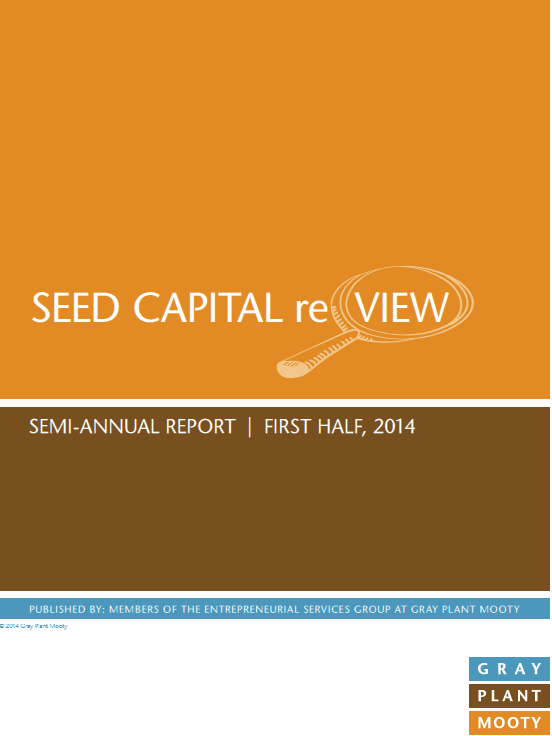 We just released our Seed Capital reVIEW report analyzing seed and angel capital being raised by early-stage companies in Minnesota during the first six months of 2014. For this report, we analyzed survey responses relating to 84 separate deals completed during the first half of this year. The majority of deal investors were individual angels or angel groups. The sample encompassed a broad range of industries, with a particular concentration in the medical/healthcare, technology, and cleantech/biotechnology industries. o Participation rights in future investment rounds. o In preferred equity deals, 80 percent reported a 1x liquidation preference. o One board seat or board observation right. o Almost all respondents reported debt with an initial term of at least one year. To review the complete survey, click here. We hope you enjoy the second publication of the Seed Capital reVIEW and look forward to your support as we collect data for the second half of 2014 (not long after the ball drops on 2015).